The PCE-PH20S pH meter for soil has been developed with the purpose of finding an effective method for directly determining the pH value of soil. With the help of this pH meter, it is possible to quickly and accurately measure the pH value of soil or a sample taken from the soil. To do this, simply insert the electrode into loose soil and reed the pH value on the digital display. Please, take into account that the first measurement requires that there is humidity in the soil. The device is always pre-calibrated by the manufacturer. 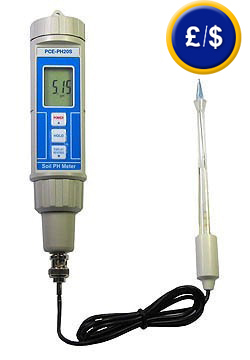 The pH meter can be constantly recalibrated using the calibration solutions that come with the device. Calibration data remains stored in the device even when the batteries have been changed. An overview of all the pH meters available from PCE Instruments are listed here. The pH meter for soil is the ideal solution for measuring the pH value in soil and earth and for formulating solutions in gardens that require fertilizers and also for use in agricultural companies or for agricultural products. 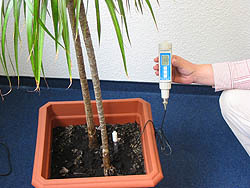 Normally the electrode can penetrate the soil and measure the pH value showing the reading on the display (see image on the left). If a measurement needs to be taken that meets the DIN standard, or if the soil is too hard to be penetrated, then a DIN earth solution should be prepared and used to obtain an accurate reading. If this process is required, you can read or print the instruction by clicking the symbol on the right. 0 to 60ºC / <80% r.h.